Siddur with Kavanot HaArizal – Zhovkva, 1781 – First "Ashkenazi" Siddur Following Nusach Sefard and First Complete "Siddur HaArizal" Printed in Eastern Europe – "His Prayer Will Not Go Unanswered"
"Order of prayers according to Kabbalah", prayers for weekdays, Shabbat and Festivals, Nusach Sefard, with the practices and kavanot of the Arizal, [compiled by the kabbalist R. Aryeh son of R. Avraham of Zhovkva]. Zhovkva, . The title page of the siddur describes the significance of praying from this siddur: "And whoever pays attention to this, to pray from this siddur… his prayer will not go unanswered… he will bring a reparation to the entire Diaspora and hasten the coming of Mashiach and the gathering of our scattered ones to the Holy Temple…". This siddur is the first complete Siddur HaArizal printed in Eastern Europe, and the first "Ashkenazi" siddur following Nusach Sefard, rather than Nusach Ashkenaz (the order of the morning blessings; Hodu before Baruch SheAmar; Psalm 25 for Nefilat Apayim; Nakdishach instead of Nekadesh, Keter in Mussaf, and more). 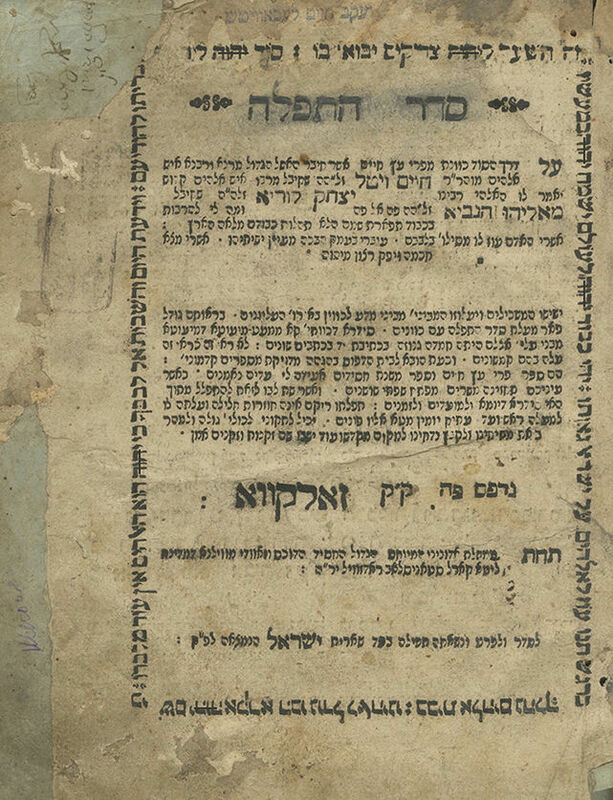 This siddur was preceded by the fourth edition of Mishnat Chassidim by R. Immanuel Ricchi, printed in Zhovkva in 1744. In that edition of Mishnat Chassidim, prayers (according to Nusach Sefard) were incorporated throughout the composition (in the chapters pertaining to kavanot on prayers). Another edition was printed in that format in Amsterdam, 1764. These editions were not considered siddurim in the accepted sense (the kabbalist R. Moshe Ostrer, a Torah scholar of the Brody Kloiz, wrote in his approbation to this siddur: "And though Mishnat Chassidim has already been printed, containing the prayer kavanot, there the kavanot appear at the foot of the page, rather than together with the text of the prayers, and there is no comparison between kavanot printed separately to those interwoven in the prayer text, in which case one can focus on them"). Subsequently, the Or HaShanim siddur was printed in 1765-1768, with the Mishnat Gur Aryeh commentary by the kabbalist R. Aryeh Leib Epstein, author of HaPardes. In that work, the kavanot were incorporated for the first time in the text of the prayers, but it was not a complete siddur, as it comprised only the Mincha and Arvit prayers for weekdays, with Birkat HaMazon, bedtime Keriat Shema and Tikkun Chatzot. This siddur is, therefore, the first complete siddur with kavanot to be printed in Eastern Europe, with prayers for the whole year, and with the kavanot of the Arizal incorporated in the prayer passages. The kavanot were selected, edited and arranged, based on Pri Etz Chaim (then still in manuscript) and Mishnat Chassidim. Ten lengthy and interesting approbations by the Torah scholars of the Brody Kloiz and from leading Galician rabbis were printed at the beginning of the siddur, endorsing the printing of this siddur and explaining its necessity and importance. Stamp on title page: "Yaakov Chaim Lebovitch". , 144, 143-192,  leaves. 22 cm. Good-fair condition. Stains and wear, dampstains. Tears and damage to title page, repaired with paper. Tears to a few other leaves. Worming in several places. New leather binding.